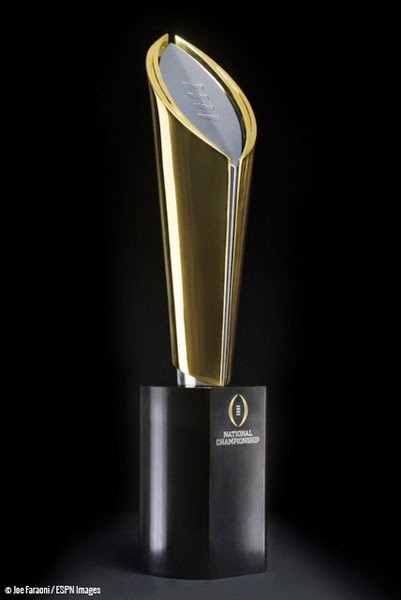 Congratulations to the winners of the first NCAA football playoff Ohio State Buckeyes to win the 2015 National Championship. They defeated the favored Oregon Ducks 42-20. This was truly a Cinderella story as the Urban Meyer coached Ohio State Buckeyes not only lost their first string QB, but also their second string QB in the last game of the Big 10 regular season. That meant they had to go into the Big 10 Championship game with their third string freshman QB, Cordale Jones. And not only did they have to go with their third string QB, because they weren't in the top 4 teams selected as the regular season ended, they not only had to win, but win in a big way to be impressive enough to be chosen as the 4th and final playoff slot. How about 59-0 over Wisconsin, is that big enough for you? Then in the first playoff game they were huge underdogs again to the #1 Alabama Crimson Tide. Almost no one thought their third string QB could do it again and lead them to victory to go into the Championship game. But Cordale Jones played magnificently again and with a huge performance from one of the best running backs in the country, Ezekiel Elliot [from St. Louis] as he rushed for an amazing 230 yards including this 85 yard run that sealed the win vs Alabama, Ohio State continued their Cinderella story. Ohio State beat Alabama 42-35 to move into the championship game where again the Buckeyes were huge underdogs to the high powered Oregon Ducks led by Heisman Trophy QB Marcus Mariota. The Cinderella story continued to the Championship as once again QB Cordale Jones and Running Back Ezekiel Elliot overcame 4 turnovers to blow out the Oregon Ducks 42-20 and win the 2015 National Championship. Ezekiel Elliot ran for another incredible 237 yards and 4 touchdowns including the final touchdown to dot the i on Ohio.